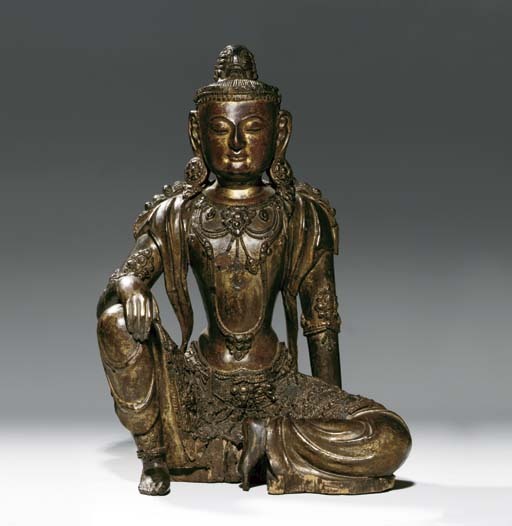 The style of the present figure belongs to a related group of gilt-bronze Buddhist sculptures dating to 14th century. This group of images is characterised by their elongated body, broad torso and slim-line waist, very similar to Malla period Nepalese bronzes. It is thought that its Nepalese influence was derived from the legendary image maker, Angie, who was active at the Yuan court whose works are well documented in Chinese records although no definitive example by the master has been identified with any certainty to date. Compare the similarity of the body and the highly ornate jewellery with a Nepalese derived lacquered wood Bodhisattva of the Yuan period in the Freer Gallery is illustrated in Hai-Wai Yi-Chen, Chinese Art in Overseas Collections: Buddhist Sculpture, no. 163.